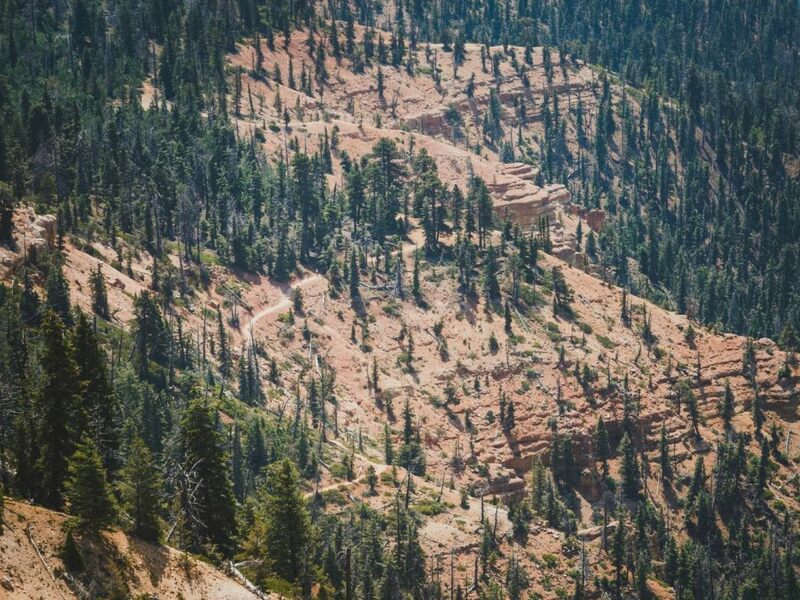 The high altitude mountain bike path of the Virgin River Rim Trail runs its course through ancient forests, across alpine meadows, and offers vista after vista. Beginning at the edge of Cedar Mountain, on top of the Markagunt Plateau, the trail meanders 32 miles to the west taking you along the headwaters of the Virgin River before terminating in the heart of Cedar Canyon at Woods Ranch. The majority of the Virgin River Rim Trail is single track. It’s non-motorized and is open to hikers, horses, and mountain bikes. While the entire length is over 30 miles it can be broken into smaller section and loops. 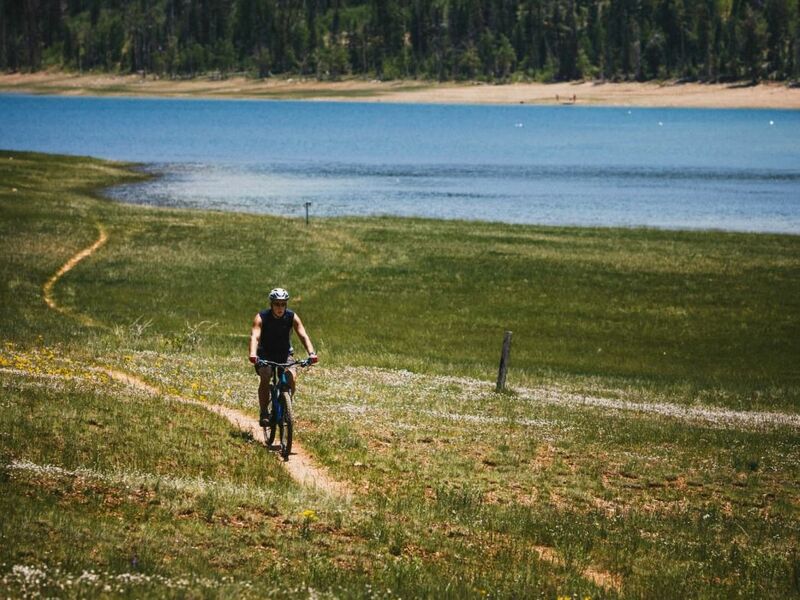 Being situated on one of the high plateaus of the Colorado Plateau, the majority of the trail resides above 9,000 feet making it an ideal place to ride if you are looking to avoid the heat of summer. In addition to being a fantastic forest trail, running through stands of aspen and pine, chances are high that you will see wildlife. The course of the Virgin River Rim Trail is also highlighted by the stunning landmarks of Strawberry Point, Pink Cliffs, Cascade Falls, and Navajo Peak and Lake. 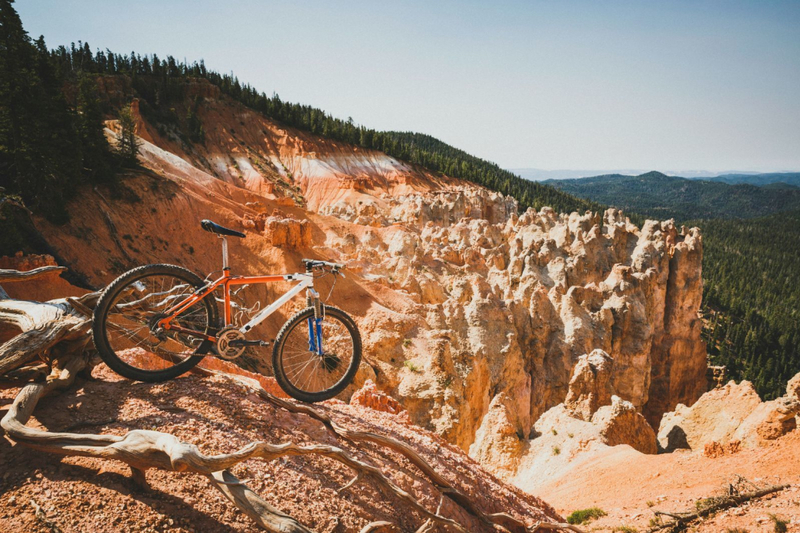 Beginning at Strawberry Point, before you start pedaling, be sure to take in this dramatic little amphitheater that is filled with hoodoos, sinks, and gorges. On the trail you will make your way beneath yellow pine and spruce, climbing your way to the Pink Cliffs. From the Pink Cliffs you will follow the single track back into the forest and wind your way to the spur trail of Cascade Falls; the source of which travels below ground for over a mile from Navajo Lake to emerge twenty feet below the rim. Back on the main trail you will hammer your way up to the limestone summit plateau of Navajo Peak. This section will take you through a ghost forest of aspen killed long ago by fire. The descent to the Te-ah Campground is an awesome single-track course through an evergreen forest. Top off your water bottle at the campground then ride with deer, elk, and pronghorn, making your way up and down for the remaining 12 miles to Woods Ranch. If you don’t want to ride the entire length you may break into the following loops. The Pink Cliffs Loop begins at Strawberry Point, follows the trail to and just beyond the cliffs. The trail will then cross Lars Fork Road, which you can ride back to Strawberry Point Road and the trailhead. About 10 miles in length. Navajo Lake Loop travels in a counterclockwise direction and begins across from Te’ ah Campground, climbs up Navajo Peak, follows the Virgin River Rim to the Cascade Falls Trail where you can follow the forest road back to the Navajo Lake Loop Trail. The lake loop trail begins east of the dike, taking you along flowing single track on the shore’s north side. About 12 miles. The beauty and solitude of this trail is spectacular. 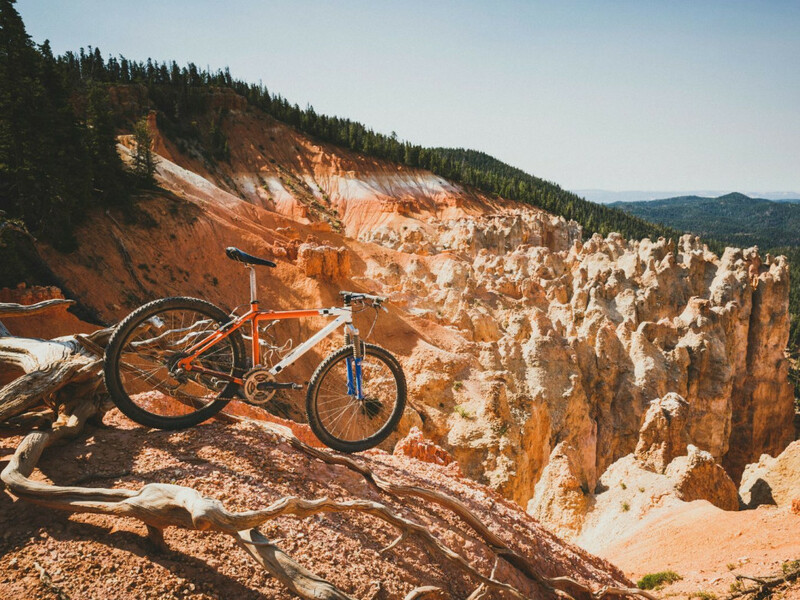 Pink Cliffs and Cascade Falls around one corner and hoodoos, gorges, and ghost forests around another will keep you pedaling for more. And what’s even better, you get to experience it all without a crowd surrounding you. The lack of crowds throughout the entire Markagunt Plateau makes riding the Virgin River Rim Trail a treat. You can go for miles and miles without seeing a soul. It can be just you, your bike, and the birds floating above that make for a spectacular mountain experience. The trail is well maintained, but is rugged in spots and contains a fair amount of climbing. This places it solidly in the intermediate skills range. If you plan to complete the entire length in one go it would fall within the advanced range for endurance. GPS Coordinates: Varies depending on which trail you take and how far you want to ride. If riding the entire trail leave a shuttle car at Woods Ranch. Woods Ranch is 12 miles east from Cedar City on Highway 14. Strawberry Point is 36 miles east from Cedar City off of Highway 14. 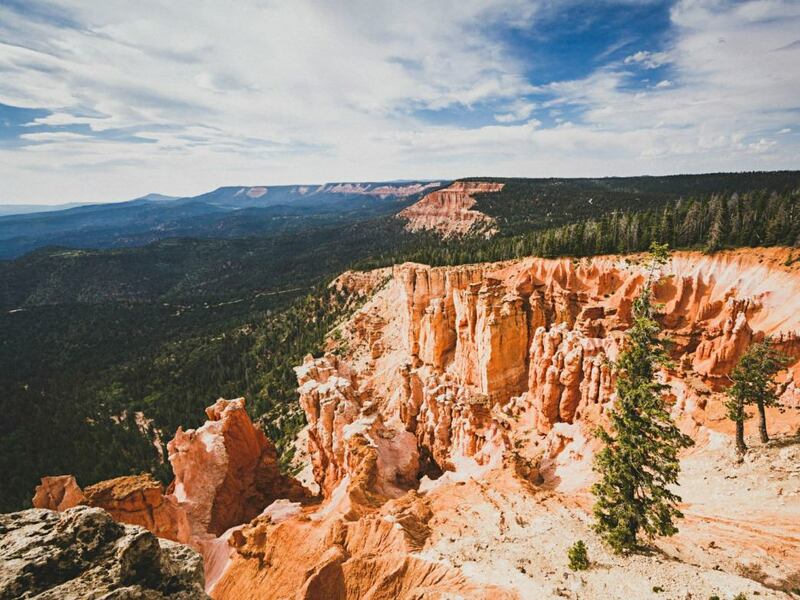 The Strawberry Point Road turnoff is 28 miles from Cedar City on Highway 14. Turn right and follow Strawberry Point Road 7.5 to the end and the over look. The trail begins a few hundred yards back from the parking at the point.